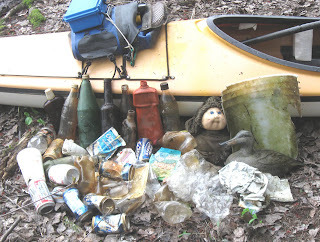 ﻿This morning's paddle/trash patrol was on the Assabet River in Maynard and Stow. I launched at White Pond Road (Russell's Bridge) and patrolled the river up to the scent mounds (pictured at left) about a half mile above the outlet from Lake Boon. 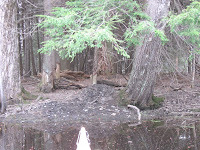 I believe the scent mounds were created by either beavers or river otters as I have seen both in this area. Today still had a summerlike feel even though temperatures were about 10 degrees lower than yesterday. Winds were a bit on the blustery side and they provided a nice tail-wind on the return trip. Wildlife seen today were red-winged blackbirds, nesting Canada geese, nesting mute swans, tree swallows, an osprey, mallards, wood ducks, and turtles. The haul totalled 47 pieces and the usual suspects were rounded-up: 24 recyclable containers (7 redeemable) and 23 pieces of miscellaneous rubbish such as styrofoam, plastic bags, nip bottles, an old doll, and a duck decoy full of water with only its tail breaking the surface. My YTD total stands at 2304.